If you use the internet, you’re no stranger to personalization (whether you’ve realized it or not). Personalization is the practice of customizing a user’s web experience based on their lifestyle, demographics, or preferences. Most of the sites we most commonly use are personalized to some extent. 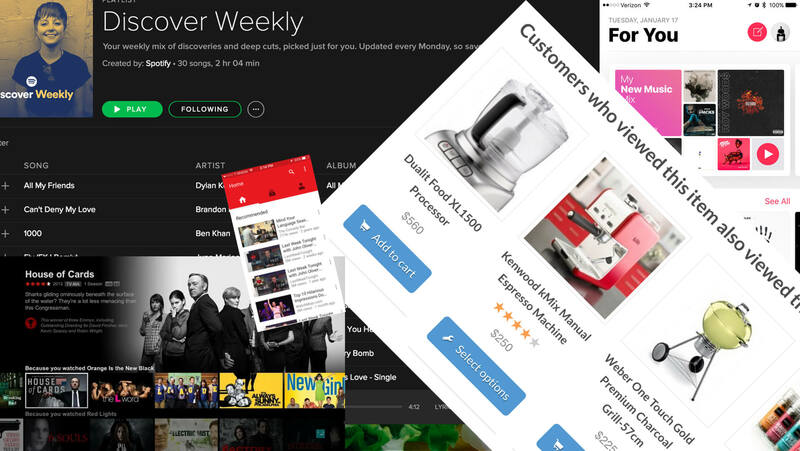 On a weekly basis, Spotify curates a playlist called Discover Weekly that is built from a list of music you may like based on what you most commonly listen to. Not only does Amazon make suggestions for additional purchases based on what other people have purchased, but they have also introduced a feature called Interesting Finds, showing you products you might love based on what you have purchased in the past. Even Facebook, a platform built on information rather than purchases, shows you the posts that their algorithms think you are most likely to relate to first. At this point, personalization has transitioned from being a shiny new feature to what consumers expect. In fact, if you’re not personalizing your customer experience, you may be falling behind. A recent Janrain study found that 74% of people are frustrated when content is not personalized. It has even been found that consumers perceive some level of control when a page is personalized directly to their specific needs. This feeling of control could come from the lack of information overload. Consumers feel overwhelmed when they are blasted with too many options that have nothing to do with their interests. In fact, people prefer personalization – even when they are unaware they are experiencing it. People crave a personal experience. In fact, three out of four consumers now expect their content to be personalized; and they’ll even reward you if it is! Shoppers tend to spend about 40% more when their shopping experience is personalized. Pandora knows if you own their charm bracelet, and will show you the newest accessories to go with it when you first open their page. This customized experience avoids overloading consumers with information, and therefore makes shopping easy, quick and fun. The most common failure is thinking just having your data is enough. It’s not, and getting data lazy could be the downfall of businesses attempting to personalize their customers’ experience. Personalization is both simple and powerful, when done right. If you have a Facebook page you already have quite a bit of quality data related to your consumers. However, Facebook has some serious gaps in their data, simply because it is up to the consumer to update their information – if a user hasn’t updated their interests since 2008, your personalization likely won’t be very effective. So, what is the secret recipe for personalization? In order to have all the data you need to ensure content is personalized, you need to expand your understanding of personalization into three separate dimensions. Personal Preferences - This encompasses everything regarding a person’s likes, dislikes and lifestyle. Are they a vegetarian? Are they outdoorsy? Is cheese their passion? Location and Environment - This refers to where a person is located and what is happening in that area. It may be local events, sporting events or simply the weather. Time and Delivery - This refers to when and how the message is delivered to a particular person. Don’t send me a haircut coupon the day after I get my hair cut. Apply the idea of the three dimensions of personalization to every marketing message or communication you send to customers. Personalizing messages to whatever extent that you can with the data you have available will increase response rates, drive sales, and create stronger brand loyalty with your customers. Combine the three dimensions with a communication channel, such as SMS or Facebook Messenger. Ideally, because you are incorporating the dimension of Time and Delivery into your marketing message, you want to ensure that you’re using a channel that has the opportunity for immediate response. While personalizing your email or direct mail campaigns will also increase response rates, they don’t tend to benefit from the personalization as much as a direct channel like mobile will. Third, and possibly most important, is to begin automating interactions using next generation cognitive computing technologies. This technology is new, and still growing in capabilities and ease of use. But implementing machine learning into your marketing will increase the amount of personalization you can employ in your messages, without having to increase the size of your staff. Now, sure, it’s easy to list these things and say it will work. But, how do the three dimensions of personalization apply in everyday life? Let’s try and imagine a situation in which you could use the three dimensions of personalization. It’s a cold and rainy day in Oregon, and you are getting ready to cheer on the Ducks in this year’s Border War against the Washington Huskies. About an hour before the game as you’re getting ready to settle in, a message appears on your phone through Facebook Messenger. It reads “How about digging your teeth into a warm meatball sub while you’re watching the game this afternoon? Come in before kickoff for $2 off!” Because you have a past tendency to buy meatball subs, and you forgot to grab lunch at the store for the game, you take advantage of the offer and visit the sub shop before the game. When comparing this kind of a marketing message to, say, an offer for an ice cream discount with the family on New Year’s day, it would almost seem like you have an unfair advantage as a marketer. But a marketer sending a message like this is simply taking advantage of easily available data within the three dimensions of personalization. Their transaction history tells them that you tend to love meatball subs (maybe a little too much. . .), they know that it has been an unusually rainy fall in Eugene, Oregon, and they know that the Ducks are about to play the Washington Huskies. Using this data to personalize your marketing content isn’t difficult, but it does take time to master. But your customers, and your balance sheet, will thank you for it later.